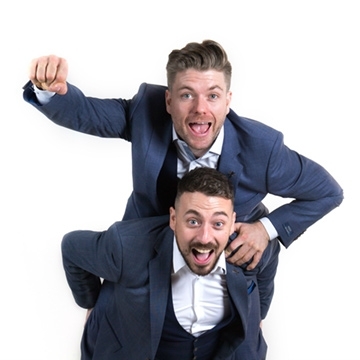 The 2 Johnnies are a hugely popular and hilarious Music & Comedy Duo, Johnny B (O Brien) & Johnny Smacks (McMahon)from Tipperary. Known for their comedy sketches and songs that capture the uniquely funny side of all things Irish. Over the past 12-18 months the guys have performed in Ireland, UK, and USA & UAE to sold out audiences of over 20,000 people! Such is their appeal and their strong base of loyal fans! And this is before their first ever actual tour! Their YouTube channel has had over 8 million views and their "The 2 Johnnies Podcast" has been No.1 in the Irish Podcast charts 38 weeks in a row, that's every single episode for the past 7 months. And the incredible stats just keep on coming! 170,000 followers on Facebook, 76,500 followers on Instagram, a further 30.7k on each of their personal Instagram pages, 80,000 followers on Snapchat and 4 number 1 songs in the Irish iTunes charts. In "Let Loose" we meet Mr. Chairman and the self-proclaimed hardest man in hurling "Noel" as they try new ways to raise funds for their club. Farmers Tom & Gerry on a recruitment drive for more farmers with their hit single "The Silage Song". A mix of sketches, stand-up comedy and songs from Internet sensations & the makers of Ireland's funniest Podcast. Hear the stories so loose, they couldn't be broadcast! !